One common problem with many sewing machines these days is lightweight build quality. Plastic parts make for inexpensive units, and a portable package that’s easy to carry. On the other hand, they make your sewing machine feel rickety and break easily. If you demand something sturdier, look no further than this guide to our favorite heavy duty sewing machines! We’ve rounded up our favorite heavy-duty models. Below, you’ll find in-depth reviews of each. We’ve also put together a buying guide to explain what makes one of these models truly “heavy-duty”, and to help you choose between them. The Singer 4432 is our most affordable pick in the heavy-duty category. It’s not the cheapest heavy-duty model on the market, but we think it’s the cheapest that’s any good. At around the $200 mark, the Singer provides a sturdy metal frame, a high-speed motor, and a stainless steel bedplate. It’s a good choice for anyone who demands ruggedness on a budget! 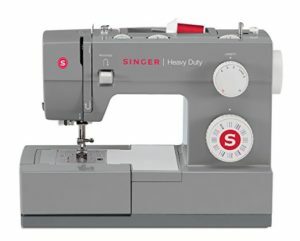 The Singer is extremely inexpensive for a heavy-duty machine. It’s half the price of our other recommendations in this guide. While we don’t think you can fairly compare it to the Janome’s below, it does have markedly better build quality than other models in its price bracket. It’s the least expensive “heavy duty”-labeled machine that actually lives up to the name! It has a metal frame on the inside. While this model still has a good number of plastic parts (as do most at this price), it has rugged build quality where it counts! Having a metal frame prevents skipping and other stitch issues by keeping the machine from flexing. It’s not just in the arm, either. The Singer is metal all around the important components, so they all stay in place. The Singer also sports a stainless steel bedplate. It won’t crack like many plastic plates that you’ll find on comparably-priced models. This one also keeps fabric moving very smoothly along, even rougher stuff like canvas or denim. You can feel the difference between this model and a normal-duty model of the same price, just by picking the Singer up! It’s a good 5 pounds (or 50%) heavier than comparable models. It’s far faster than other models at this price! This one has speeds up to 1100 stitches per minute. That’s thanks to a motor that’s 60% stronger than the normal duty Singer. Since it has a more powerful motor than comparable units, it doesn’t have to work as hard for normal use. So, you can expect better motor life. Plus, you can cover lots of ground quickly if that’s what you need to do! The Singer’s heavier build and more powerful motor are especially handy for working with heavier/thicker fabrics. Leather and denim are particularly easy to work with on the Singer, compared to other models around this price. This one’s popular for outdoor fabrics, as well as among craftspeople who work on coats, hats, and bags–anything requiring thicker, heavier materials. It still has plenty of conveniences onboard. There’s an automatic needle-threader, for one thing. Instruction diagrams for using it are printed right on the casing. The Singer also has a simplified, user-friendly bobbin system. You just drop your bobbins in, rather than having to use an awkward side drawer. There’s also a clear window over the bobbin compartment, so you always know how much thread you have left. It has a one-step buttonhole feature, and it’s fully-automatic. The Singer has 32 built-in stitches, selectable via a dial on the front. The diagrams for each stitch are actually on the dial itself, so you don’t have to look at a separate chart or consult the manual to find the one you want. There are 6 basic all-purpose stitches, 7 stretch stitches, and 18 decorative stitches onboard. You can control the pressure of the feet manually. That’s handy, given that automatic adjustment feet on models of this price aren’t usually all that good. The feet can also be lifted higher than other Singer models, which is a design tweak intended to help you on thicker materials. It has a built-in free arm for cylindrical sewing. All the accessories can be stored onboard. There’s a convenient app you can use to access the manual, follow along with tutorials, and troubleshoot your unit. It works on both Android and iOS devices. It’s covered by a 25-year warranty. Singer’s build quality has slipped a long way in the past decade or so. While this heavy-duty model is a lot better than their normal machines, it’s still disappointing in many ways. Aside from the plate, the entire casing is plastic. So are the knobs. Overall, it still feels cheap. With that in mind, it’s no wonder that the Singer has a spotty reliability record. In many cases, it can last for years without any serious issues. That’s not the case with other Singer’s these days. However, as with lots of Brother models, quality control for this model is a bit poor. A certain percentage of these units turn out to be lemons on arrival, or start having problems quickly. The rest are perfectly fine. So, our advice for those going with the Singer is to do a thorough inspection and test run as soon as you get it, to be sure you get a good one. As with many inexpensive models, the pedal on this one is anything but subtle. It would be nice to have a sliding speed adjustment on this one, but you won’t find that feature on very many manual models. As with so many sewing machines, a good portion of the negative reviews you’ll find online for this machine are due to user error. Things like jammed bobbins, birds’ nest thread, and off-center needle positions are all easy to correct if you take the time to read the manual and make appropriate adjustments. Since timing and tension issues are so common, though, it’s not something we recommend to professionals, regular seamsters. Even if you can problem-solve your way out of a jam, nobody who works with fabric for a living should be dealing with those issues. This model is definitely a heavier-duty build than comparable Singer’s and Brother’s at the same price. However, it’s not nearly as heavy-duty as the Janome’s below. We think it’s a good idea for budget shoppers who need sturdiness. If you can afford better, though, you should know that you’ll get vastly better quality above $400. The Janome HD3000 is a classic workhorse sewing machine. 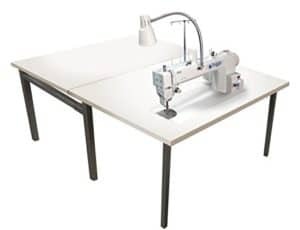 It’s one of our favorite sewing machines ever, and even though there are much fancier models on the market today, it’s still our go-to for tough performance. The HD3000 one-ups the Singer with metal casing and gears, as well as an all-metal frame. It’s much more rugged than the Singer, and has a much better reliability record to match. If you want the best of the best in heavy-duty sewing, and don’t mind an all-manual machine, grab one of these! It sews up to 860 stitches per minute. While it’s slower than the Singer, it’s surer. The Janome has metal internal gears, which make it hardier under load. Plus, despite the difference in top speed, it sews through leather and denim like butter. The Janome leaves neat, consistent stitches on tough materials and layered pieces. In terms of consistency and neatness, it’s much better than the Singer. The feed dogs work more smoothly, the motor holds up more steadily, and this one never misses a stitch. It’s smooth and quiet. This machine is the definition of a workhorse. 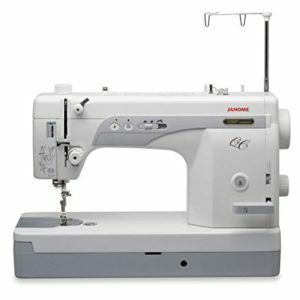 The HD3000 is a favorite in costume shops, sewing classrooms, and many other spots which see high wear and tear. It’s one of the best sewing machines on the market for learning, since it can hold up to newcomers’ user error and clumsiness without breaking. Why do we think it’s so much better than the Singer? To start with, a lot more of the Janome’s important parts are made of metal than on the Singer. Most of the casing is aluminum, where the Singer’s is plastic. The Janome has a metal internal frame, metal gears, and an overall build which simply feels much more reassuring than the Singer. 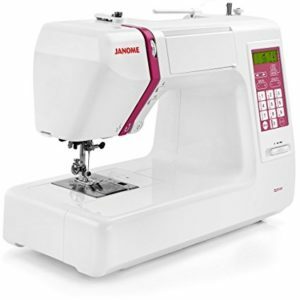 In the same way that you can immediately feel the difference between the Singer and other models in its price range, you can feel the improvement in the Janome over the Singer. It’s several pounds heavier. The extra rigidity makes it much better at tough tasks which can throw off something more lightweight. It can handle layered material with ease, and lasts for years. It’s better for the toughest outdoor fabrics like Cordura. Overall, Janome’s have much better reliability records than Singer’s these days. This model is no exception. To paraphrase common wisdom, if a machine says “heavy-duty” all over it, it’s probably compensating for something. The Janome doesn’t advertise its build quality as much as the Singer, largely because it doesn’t have to. It just works. There are 18 built-in stitches. They’re all diagrammed on the arm of the machine, in a way that’s as legible as the Singer’s dial. It has a free arm, and an extra-high presser foot clearance for better maneuverability. You can also drop the feed dogs for free-motion work. The pedal is much better than the one on the Singer. You can adjust the pressure with a simple dial to control how responsive it is underfoot. As a result, it’s easier to find a speed that’s comfortable for you. It has a simple lever to reverse any stitch. You can adjust the length and width of each right on the front panel. The snap-on presser feet are as durable as the machine. That’s another departure from the Singer, which has rather disappointing foot construction. Like the Singer, the Janome is covered by a 25-year warranty. Unlike the Singer, you’re very unlikely to need to use it! There was an isolated issue when the machine first came out, with units that shipped only sewing backwards. That isn’t something we had trouble with, and in any case, it seems to be resolved now. As with the Singer, you’ll find that most of the negative reviews for the Janome have to do with user error. Trust us. We’ve used this one extensively, and haven’t had any problems that weren’t easy to troubleshoot and tweak. Reviewers complaining about tension issues or thread mishaps clearly haven’t read the manual properly. With that said, no machine is perfect. We’re sure that some folks have ended up with broken parts, but in most cases, those are preventable if you take care to learn the machine thoroughly and use it properly. It’s fairly basic. So are most heavy-duty models. If you want something more elaborate or versatile, try the DC1500 below. It’s not technically classed as a heavy duty model, but it’s every bit as rugged as the “heavy-duty” crowd. It’s expensive for an all-manual model. This one can cost as much as $500, depending on whether you get it as a standalone machine or with a value pack of accessories. The bobbin compartment is a bit old-fashioned compared to the one on the Singer. If you want the ruggedness of the HD3000, but want some extra creature comforts, the Janome DC5100 is a our overall top pick. It’s not technically a heavy-duty model, but it may as well be! The DC5100 has a full onboard computer system with a massive stitch library that outdoes any other heavy-duty model below $1000. It’s easy to navigate, and gives you plenty of options without including any breakable components. We recommend it to anyone who likes computerized sewing machines, but is sick of running into problems with durability. 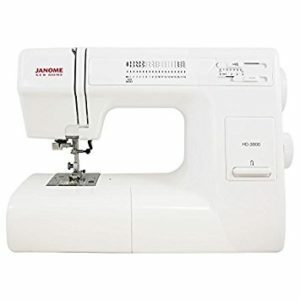 The Janome DC5100 is a much better investment for the long haul than anything else with a computer under $1000. As you’d expect on a more expensive machine, the DC5100 keeps all the conveniences of the HD3000. There’s a built-in threadcutter, just like on the HD3000, and it has the same automatic needle-threader. It has an automatic bobbin-winder, too. The biggest difference: it’s fully-computerized! The DC5100 has an onboard computer with an LCD screen and touch-pad navigation. Having a computer helps you in lots of ways, but so often they can cost you in the durability/reliability department. Not this one! It has a spectacular track record over the long term. It has lots of stitches onboard. Compared to the all-manual models above, the DC5100 is infinitely more versatile. It has 167 unique built-in stitches onboard. There’s also an entire alphabet for monogramming, and a grand total of 5 different one-step buttonhole styles. Most machines with this many stitches have to be scrolled through manually in the computer. The Janome gives you a flip-down chart built into the arm, so you can quickly consult your options before keying them in! It’s a lot easier than digging out the manual, and you can flip it back up to the closed position to get a clean, uncluttered look. The machine will also give you a suggestion for the best foot to use, depending on the stitch you’ve chosen! You can set memorized positions for the needle up and down settings. That’s something you can’t do on the manual machines above. It has auto-declutch bobbin winding, plus Janome’s SFS (superior feed system) onboard. It has automatic thread tension control, unlike the HD3000. There’s also a manual backup knob for tweaking the settings yourself. We don’t think you’ll need to use it, though. This one does extremely well on layered pieces, and it adjusts in real-time as you change surfaces. Between the automatic controls, sturdy construction, and powerful motor, the DC5100 has as solid performance as the HD3000 on difficult materials. Flannel, denim, and other heavy materials are no problem at all. Just use the appropriate needles, and you’ll be all set. It has the same great 7-piece feed dog system as the HD3000, as well as a drop feed and free arm. You can control the speed precisely via a slider on the front of the machine. That gives you much better finesse than you can achieve on an all-manual machine, even the HD3000. Stitch width (up to 7mm) and length are adjustable right on the screen. One great feature this system has is a memory bank, which allows you to store your custom stitch patterns onboard! So, if you have a signature stitch that you use to border all your linens, for instance, you can preset it and have easy access to it whenever you want! There are 50 onboard pattern slots for you to use.You can also use them to set patterns, and combine different stitches! The size of the monogramming font is adjustable as well. You can store your accessories in a tray under the base of the machine. The whole thing stores in a sturdy hard cover that ships with the DC5100. We wouldn’t be listing this one in the heavy-duty category if it weren’t substantially sturdier than other computerized models. At nearly 20 pounds, the DC5100 has some rugged heft to it, to be sure! The manual is extremely thorough and helpful. It makes it easy to acquaint yourself with a fairly complex machine. Plus, it gives you practical troubleshooting advice that we think is more than enough to get you out of any issues. As with our other picks, it’s covered by a 25-year warranty. This one also has close to a spotless reliability record. Even though it’s fairly recent, it has a very old-fashioned worklamp. It’s an incandescent bulb, which doesn’t put out as much light or last as long as modern LED bulbs. You can always replace it with a standard LED for sewing machines. It’s pricey, compared to our other recommendations. This one is more than three times the price of the Singer, and adds a good $200+ to the cost of the Janome HD3000. That’s what you’ll pay for a hardy computerized model, though. The keypad and display are intuitive and easy to navigate, but they aren’t as good as touchscreens on other computerized models these days. It’s a price we’re willing to pay for sturdiness. While it’s certainly a good deal more rugged than other computerized models, it’s not built quite as indestructibly as the HD3000. It has a mix of metal and synthetic (mainly nylon instead of plastic) parts. All the key components are metal, though, and this one doesn’t have any known reliability issues or design flaws that we’ve discovered. We don’t think you’ll find a heavier-duty computerized model for less than $1000, which is generally as much as we advise most people to spend. If you can afford a more premium machine for home use, or are a professional who can justify spending more than $1000, have a look at our See Also pick below! Now that you’ve seen our recommendations in the heavy-duty category, let’s figure out which one suits you best! The Singer is the clear choice for anyone on a tight budget. It’s half the price or less of our other recommendations. While we don’t think it compares well to our more expensive picks, it is the best at its price point in terms of durability and power. It’s the least expensive heavy-duty machine we recommend. We have mixed feelings about the Singer, though. We wanted to recommend something to folks who can’t spend $400, but we also think it’s important to clarify just what you’re getting for ~$200. This is certainly a heavier-duty model, but only for its price range. It pales in comparison to more expensive machines. We think that if you’re on a tight budget, you should go for the Singer and know that you’re getting something sturdier than anything else for the price. You should definitely go for some extra warranty coverage, though, because it still has a lot of plastic parts. If you can afford to spend more money, we think the Janome HD3000 is the far better choice. It’s rugged in a way that knocks the Singer out of the park. The Janome has a sturdy aluminum housing, and internal components that are nearly all metal. It might be a bit slower and have fewer features, but it’s a true workhorse through and through. This one can stand up to heavy, layered materials that even the Singer’s souped-up motor can’t get through. And since it’s so sturdy, it’s extremely unlikely to have any issues. The big downside of the HD3000 is the simplicity of the machine. That makes it good to learn on, and keeps the amount of parts that can break to a minimum, but it also limits what you can do with this one. If you need more features or want a computerized experience, go for the DC5100 below. The DC5100 is by far the best sewing machine here, even if it’s built slightly less like a tank than the HD3000. It’s more versatile, more convenient, and offers far more room for customization. Don’t expect to find it for under $600, though. We would also recommend some added warranty coverage for this one. It’s not likely to break down on you, but computerized systems aren’t as sound an investment as something old-fashioned like the HD3000. 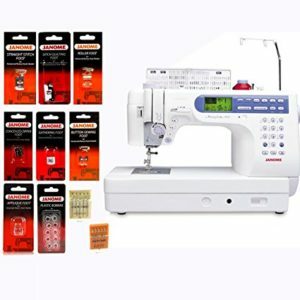 The Memory Craft is overkill for the vast majority of users, but if you want the most versatility possible without sacrificing quality, it is a fantastic sewing machine. This is something we’d recommend to full-time professionals, or to passionate home craftspeople who can get their money’s worth from it. While the Memory Craft looks and performs like a very modern sewing machine, it has the feel and build quality of a classic appliance. It’s weighty, steady, and sure. This is faster than the DC5100, and it has far more built-in features. With a massive stitch library and infinite room for adjustments, you won’t ever outgrow this thing. It gives you more workspace, more convenient features, and an automatic thread-cutter. There’s a lot in this machine, and absolutely none of it feels cheap. It’s similar to the Brother PQ1500SL that we recommend in our quilting guide, but faster and even more rugged. It’s a straight-stitch machine that will go through absolutely any materials. You can do layered canvas seams, vinyl, and any sort of tough, weatherproof materials. This one goes up to 1600 stitches per minute, and has an impeccable record for durability and reliability. We suggest the Brother for quilters who want industrial quality, as well as professionals who work with the thickest, toughest materials. This Janome is especially good for outdoor, high-resilience fabrics. It’s definitely overkill for the average home user, though. It’s an all-metal unit with all-manual adjustments. It might lack the computerized conveniences and added features of some other long-arm machines, but the Tin Lizzie is absolutely indestructible. The Tin Lizzie has a whopping 18”x6” throat space, and variable speed control. We think it’s a great choice for any demanding quilter. In this buying guide, we’ll show you how to tell whether a sewing machine is really heavy duty or not. We’ll also help you figure out which of our recommendations is going to be the best choice for your applications! Heavy-duty machines should be brawny in their build quality, but they should also have more powerful motors. The bigger the motor on your machine, the better it will do with “heavy-duty” fabrics like canvas, denim, etc. Those are usually the biggest causes of burnout or stalling on normal sewing machines. It’s always better to have a slightly overpowered/overbuilt motor. That’s because even if you’re not pushing it to its limits, it’ll have to work less hard than something smaller and less powerful. If the motor’s under less strain every time you use it, it’ll last longer. One easy (if simplified) way to tell how powerful a machine’s motor is is to look at the top sewing speed. It’s a spec that’s listed on nearly every model, and it gives you a rough approximation of power. You can also get a sense of how heavy-duty the motor is by looking at the weight of the machine. The internal frame is one of the most crucial components in making a sewing machine heavy-duty. You want an all-metal frame as standard on anything you buy in this category. That’s also something we recommend in general for any intermediate or advanced sewists. Having an all-metal frame is good for a number of reasons. It makes the arm of the machine much more resilient to breaks and cracks. It also lends rigidity to the whole design. The more rigid your machine, the less likely you are to have problems with wonky threads, misaligned tension, and so forth. If you’ve found that thicker materials make your standard sewing machine judder and shake, or even wobble, you’re probably working with a frame that’s not entirely metal. When we talk about the frame, we’re not just looking at the arm of the machine. The frame should extend from the needle end of the arm to the plate end of the base. You want the frame of the entire sewing machine to be rigid and sturdy. Internal gears are another feature which really separate the heavy-duty models from the rest of the market. Most sewing machines have plastic gears these days. They’re the absolute worst choice for heavy-duty work. They break, warp or have other issues in no time. A true heavy-duty machine should have metal gears. Sadly, they’re becoming a rarity in the market these days. Even many of the nicest models have nylon gears. Nylon is a lot better than plastic, since it’s shatterproof. However, it can still warp. Look for metal gears whenever possible! The casing of most sewing machines is plastic. That’s not a huge downside for most people. It always feels cheap, though. If you’re buying for a setting which sees a lot of wear and tear, like a classroom, costume shop, or professional workplace, we think it’s worth investing in something with an aluminum frame. Again, you’re adding to the overall rigidity of the machine, as well as preventing cracked casing. As with choosing between any other kind of sewing machines, you have to think about which kind of heavy-duty machine suits your needs best. Are you going to be quilting? Making garments? Working with outdoor/weatherproof fabrics? Have a sense of all your projects in mind as you shop and consider features. Do you need an onboard computer? If so, you’ll need to spend quite a bit more for something sturdier. If you can make do with fewer features, manual machines offer the best durability and a lower cost. Figure out how much you can afford to spend up front. No matter which price range you look in, though, plan to spend as much as twice the price of a standard machine for an equivalent heavy-duty model. Any heavy-duty machine should last you years of reliable service. However, just because something is heavy duty doesn’t mean it’s infallible. With nearly any sewing machine these days, we recommend buying extended warranty coverage. Or, if you’re planning to rely on the manufacturer’s warranty, make sure there’s a dealer nearby so you’re not stuck shipping a heavy model back to the company for service. If one of our heavy-duty picks seems like a good choice for you, great! Click on one of the links in its review, and you’ll be able to see more specs, as well as current prices. For those still searching for their ideal heavy-duty machine, we suggest having a look at our all-around favorite sewing machines on our homepage. Our overall picks are rugged and reliable, even if they’re not sold under a “heavy-duty” banner. Finally, if you need something with specific features that you don’t see listed in this guide, try one of our more specific ones! We have guides to the best sewing machines for leather, embroidery, and much more. Find them all on our homepage.